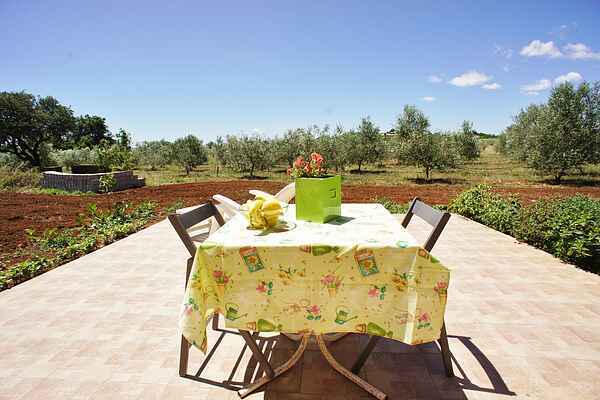 This lovely bungalow just outside Medulin has a very spacious garden with many olive trees. You can enjoy quiet location on the terrace with garden furniture, but you can still be in the hustle and bustle in no time. Popular and lively Medulin is only 4 km away, and there you will find restaurants, shops and a wide range of entertainment. The unique sand beach Bijeca is just as much of a tourist attraction, especially for families with young children. 4km to the north of your bungalow is Pula, and is definitely worth a visit; you can still feel the Roman atmosphere here. In particular the imposing intact amphitheatre, one of the world's largest, recalls long-gone times. Other lovely recommendations for a day trip are Porec, with the lovely Byzantine Euphrasius basilica, and the historical city of Rovinj. Or take a boat from Fazana to the protected Brijuni islands.